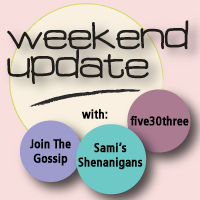 Join The Gossip: The FIRST Weekend Update Linkup! That purple nail polish is awesome. I had some bad luck with a bad no-chip mani this weekend. It literally crawled off my nails in the Chicago humidity three days after I got them done. That's $35 down the drain...lovely. Low key weekends are the best!! Low key weekends are fun! Today has been low key, but last night I went and saw Chickenfoot and it was amazing! Quiet weekends aren't bad at all... especially when there's crab, blue cheese burgers and a cute pup involved! Mine was low key too and I loved it! That was a pretty damn good weekend--family, food, and pets! Plus, I loooove that violet color. It's so bright! I am excited to link up and will do so at some point this week. I'm finally getting back into the swing of blogging! Your pup is so stinkin' adorable!! I want to squeeze him. (or her?) I love your purple nail polish too! Have a fabulous Monday, my dear! That food looks so good! You shouldn't be making me hungry on a Monday morning at 8am like that! :) Love your puppy too! Excited for your first linkup! Fun link up. Just found you from Meg at Henning Love and am now following! Your pup is adorable!! I can hardly handle the pictures in this post! I want to steal your dog and cuddle all day long, I'm dyyyyying over how amazeballs that burger looks, and that purple nail polish is fab! Okay, I'm not a huge fan of crab legs, but everything else?! LOVE! The photo of your sleeping pup is adorable! Thanks for hosting the link up! I will have to stalk you on here and on Instagram. Love that nail polish color. I have one very similar! Glad I found this link-up!! Such a fun link up! Glad I joined the party! YAY, for a relaxing weekend. Going to hop over to check out your guest post now!! Have a super week!! That burger looks amazing! I've got to plan an awesome weekend so I can link up! Haha! what a great link up!! love! and that pup is so cute. oh my gosh. i've been following your blog for a while and totally just realized i wasn't actually following you on gfc. sorry for failing at being a good blog friend!!! thanks for hosting the link up lady! Thanks for hosting the linkup!! I love the food pics. Yum. I take pics of my food all the time on Instagram! Oh my goodness your pup is so cute!! Found your fun link up thru Shanna Says So. Love the purple nails. New follower to your fabulous blog...I'm a SoCal gal too! Eating is always good. :) thanks for hosting!